Tottenham v Manchester UTD double price boost - back 6/1 Spurs to win or 12/1 Manchester UTD to beat Tottenham when you join Betfair via our special links. Plus, £10 money back if your bet doesn't win and up to £100 in free bets for new customers! Tottenham lost ground in the title race as they were held to a 1-1 draw with Liverpool last time out and the Spurs are now seven points behind Premier League leaders. Mauricio Pochettino's men have only lost one game in their last 11 Premier League outings. The Red Devils have recorded back-to-back 1-0 victories over Man City and Everton in the Premier League in their last two games but they have also lost two of their last three away league games. They are just one point shy of fourth-placed Man City and five behind third-placed Arsenal. Are you placing a bet on this match? 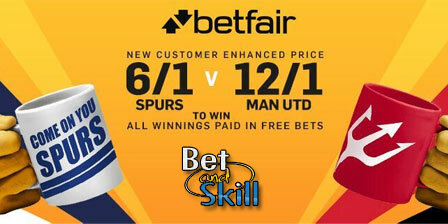 Don't miss these price boosts - 6/1 Tottenham or 12/1 Manchester UTD to win at Betfair! Place your first bet (max £/€10) on TOTTENHAM or MAN UTD to win Sunday's Premier League fixture. For every 5 x £/€10 single bets you will receive a £/€20 free bet token. Bets placed using free bet tokens as the stake (in full or in part) will not qualify. Enhanced Prices you will be credited your bonus winnings, paid as free bet tokens, usually within 24 hours after the event has settled. Bet Bundle free bets will be credited within 24hrs after your 5th qualifying bet is placed, repeated up to 5 times. "Tottenham 6/1 or Man UTD 12/1 to win at Betfair (Risk-free enhanced odds - 10.4.2016)"